I have created a very simple website to announce On Target Training Firearm classes, which will help us share what we are doing and expedite registration. A course which will include the firearms and ammunition. This is for people who have never fired before, or for people who want to try a variety of handguns and calibers, and get more comfortable. It is ideal for spouses and youth who want to learn in a comfortable no-stress environment. This one-day seminar will cover the following skills sets vital for self-defense, concealed carry, and action pistol shooting events (IDPA or USPSA): rapid drawing from a holster and target acquisition, quick placement of multiple hits on a target, rapid placement of hits on multiple targets, use of cover – moving to cover and firing from cover, use of movement – while drawing, moving to cover, and while firing, and techniques for smooth and rapid reloads. We will end the course with shooting mini-scenarios applicable to self-defense situations or an action pistol match, in which all of the skills practiced during the day will be utilized. This course is designed for rifle students interested in mastering accuracy and speed on both paper and reactive steel targerts using a variety of positions and movement. Drills range from focusing on traditional rifle positions and accuracy to firing on the move, firing on steel from distance behind cover, adverse firing positions, decision making and reactive drills. Students at all skill levels benefit from taking this course to improve their accuracy and speed. The day will end with challenging field courses designed to use the skills practiced during the day, and will make use of the rolling wooded terrain on this property. You are cordially invited to a Ring of Freedom Reception To welcome Heide Kaser, NRA Women’s Leadership Forum. Hosted by Marsha Petrie Sue and Judi White Thursday, March 18, 2010. At the home of Marsha and Al Sue. Please register with Judi White and the address will be sent to you. The NRA Women’s Leadership Forum unites women of influence to defend our Second Amendment freedoms and help guarantee the future of the NRA through philanthropic leadership. If you love this Country, our Constitution and our Second Amendment, Please join us Space is limited, so don’t delay! the most beautiful shades of purple, green, and yellow from my face to my collarbone, and down my bicep. The shotgun was too long, and my long neck and high cheekbones made it impossible to mount the gun properly to my shoulder while maintaining a proper sight picture (which is critical to defensive shotgun shooting). I lifted my face off the gun while shooting creating a horrible flinch, and all of the bad habits that ensue when shooting an ill-fitted gun followed suit. I was convinced that no one had ever hated a shotgun like I did in my bruised and frustrated condition. without pain, and share with others (especially women), the training and tricks I had learned over time. 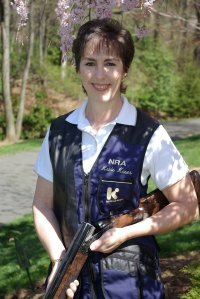 Thirteen years later, armed with the knowledge that comes from first-hand experience and training, I was hired by the NRA’s Law Enforcement Activities Division. I had the opportunity to share what I had learned by training police officers and members of the military to become Law Enforcement Firearm Instructors in handgun, rifle, and yes, shotgun. I set my sights on expanding my shotgun knowledge into other realms.I sought out top combat and competitive instructors, and made great progress after spending a week at Tac Pro Shooting Center in Texas with Bill Davidson, and practicing with the United States Practical Shooting Association (USPSA) Grand Master Greg Wodack (who manages the NRA Range in Fairfax, VA).